In a new twist in an ongoing struggle over the powers of inspectors general, the Justice Department’s watchdog on Tuesday released a report showing continued resistance by the FBI in sharing documents requested by IG investigators. The FBI since 2010 has argued that it cannot share information from National Security Letters it uses in terrorism and leak investigations, as well as material involving electronic surveillance, grand juries and credit reporting. Inspector general Michael Horowitz has argued that access to such documents is key to his office’s independence, and is awaiting both possible action by Congress and a ruling from the Justice Department’s Office of Legal Counsel to resolve the dispute. Horowitz’s new report addresses agency compliance with Section 218 of the department’s fiscal 2015 appropriations bill, which states that no funds shall be used to deny an inspector general timely access to requested Justice Department documents and records except under limited conditions set out in the 1978 Inspector General Act. Overall, the IG wrote, the section “has had a positive impact on our ability to get timely access to records from department components, with the exception of the Federal Bureau of Investigation.” The Drug Enforcement Agency, for example, shortly after the provision became law “produced materials in two ongoing OIG reviews that it had not timely produced to the OIG prior to Section 218’s enactment,” the report said, describing DEA’s delivery of unredacted information involving confidential sources. But the FBI continues to withhold some documents, saying it is working with the deputy attorney general on a solution, the report said. The Office of Legal Counsel after a year has not rendered its opinion, the IG noted. 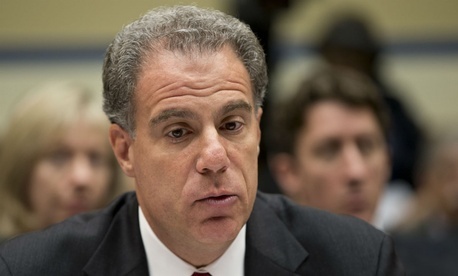 “It is extremely important that this issue be resolved promptly because the existing process at the department, which as previously described essentially assumes the correctness of the FBI’s legal position, undermines our independence and impairs the timeliness of our reviews,” Horowitz wrote.